When the last version of NT Support Tool 4.85 is installed, Omron PT models with system versions 3.2/4.2 are missing, making it impossible to upload from a PT with this system version or open a *.onw file with this system version selected. 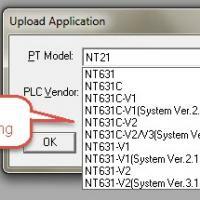 This registry fix adds the missing system version to NT Support tool. Extract the registry files and double click the appropriate one (32bit or 64bit Win7) to add the registry entry.